Star Trek Into Darkness is the latest offering by sci-fi god, J.J. Abrams. To me, the funny thing about Paramount choosing Abrams to reboot the Star Trek franchise is that he seems like a Star Wars guy, not a Star Trek guy. (In case you didn’t know, Abrams is also directing the next Star Wars movie.) I totally believe he’s the right guy for Star Wars, but I never saw Abrams as an obvious choice for Star Trek. Trek is deeper, smarter, and wastes valuable screen time by sitting its main characters around a conference table for hours on end. Star Wars is simplicity itself and focuses on special effects and things going boom. That’s the sort of thing Abrams is good at. Despite this, I liked the previous Star Trek movie. It could have used some of the smarts that went into the TV shows that came before it, but it was totally enjoyable. And, most importantly, the characters felt right. 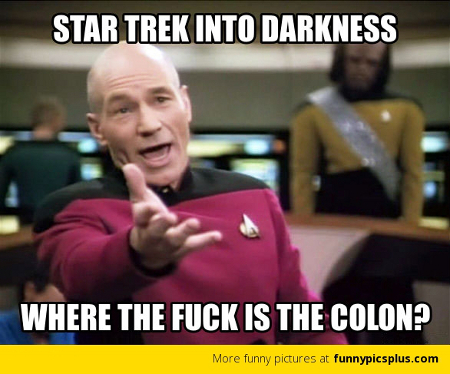 Can the same be said for Star Trek Into Darkness? Or should we set phasers to kill? If you try to control and "fix" other people, you will spend your life in disappointment.